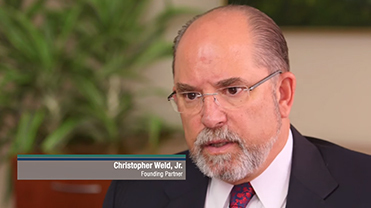 Christopher Weld, Jr. is a Founding Partner of Todd & Weld LLP and has over thirty years of experience in business litigation, arbitration and dispute resolution. He has achieved favorable results for clients through trials, arbitrations, mediations and negotiated resolutions. His cases have been widely varied, but generally have the common thread of presenting a business dispute with vigorously contested issues of substantial value. For example, his representation has varied from the trial of a partnership dispute involving complex valuation of commercial real estate which was ultimately resolved in favor of the Firm's clients both at the trial level and the Supreme Judicial Court of Massachusetts, to assisting a Joint Venture in the negotiation of tens of millions of dollars of change orders on the Big Dig construction project in Boston, Massachusetts without ever filing suit. Mr. Weld's experience has also included representation of a six-state New England Class in an action against Goodyear Tire and Rubber Company arising out of defective radiant heating hose. He was very active in negotiating and obtaining court approval for a national settlement with Goodyear valued at approximately $320 million. He acted as class counsel for the national class. Mr. Weld has had substantial experience with representing partners, shareholders, limited partners and individuals in connection with closely held corporate disputes, general partnership disputes, limited partnership disputes and the breakup of business entities of all types. Mr. Weld's practice has also included intellectual property litigation, claims involving commissions and employment issues as well as probate litigation. He has also been involved in several eminent domain cases of significance representing plaintiffs. Over the last fourteen years, Mr. Weld has handled several major lawsuits on behalf of the Massachusetts Housing Finance Agency involving complex issues of public finance and with significant potential exposure to the Agency. In one such matter, the Firm has been successful in effectively resolving the case through dispositive motion practice and the negotiation of over $100 million in claims. Mr. Weld has extensive experience and expertise in connection with the management of risk and the resolution of disputes in connection with complex construction projects both in the public and private sectors. Representation has included owners, general contractors, design-build contractors, subcontractors and suppliers. In addition to providing litigation, arbitration and alternative dispute resolution services in the construction context, Mr. Weld has also been instrumental in negotiating contracts on extremely complex projects including a public design/build project in excess of $200 million. In the context of dispute resolution, the Firm's representation of owners and construction professionals has included substantial claims for delay, differing site conditions, change order work and contract balances of all sizes. Mr. Weld has also been involved in several bid protests arising out of publicly bid projects involving major public procurement agencies such as Massport and Mass DOT. Mr. Weld's representation has included such prominent clients as Massachusetts Housing Finance Agency, Jay Cashman, Inc., Suffolk Construction Company, The Congress Group and The Boston Celtics, as well as numerous individuals and businesses of all sizes in widely varied industry sectors.